House Democrats on Thursday launched a 66-member Medicare for All caucus, which includes hospitals as some of its private industry supporters, according to the group's founder. Several community health centers have publicly endorsed a move toward a single-payer system, according to caucus founder Rep. Pramila Jayapal (D-Wash.). Some hospitals were part of the talks that led to forming the Medicare for All group. The lawmakers want to land on concrete, tangible policies to start a seismic shift in the U.S. system. 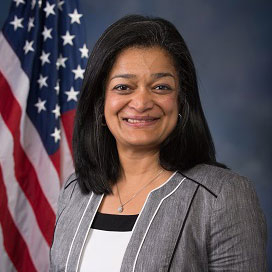 "Some of the hospitals have been privately interested and supportive but also have some concerns," Jayapal said, noting that small businesses have been particularly involved because of the limitations they feel "being tied to a healthcare system that does not benefit them." While the caucus is largely an organizing attempt to marshal political support, Jayapal hopes it will provide a structure to hammer out details—including how to pay for such a policy—that have been missing from previous proposals, such as last year's Medicare for All bill by Sen. Bernie Sanders (I-Vt.). It garnered support from prominent members of the Senate Democrats' left flank, like Sens. Kristen Gillibrand of New York and California's Kamala Harris, but Democratic leaders from both chambers have kept the measure at arm's length. One thing Jayapal made clear is that she does not want to pursue the public option, such as the Medicare or Medicaid buy-in proposals that House and Senate Democrats have released over the past year. While she conceded that any coherent policy needs to proceed incrementally to navigate the massive employer-based system that covers just under half of all Americans, Jayapal views the public option as too great a risk. "I actually think there is a lot of research that shows that a public option would actually fail because what you would end up with is only people who are not able to buy into or be covered by another option, which means you might end up with a population that's particularly ill," Jayapal said. "We can't afford to have public option fail, because if you're seeing that as a step to a healthcare for all system, you actually do yourself harm." The caucus plans to have monthly or bimonthly briefings and work with industry analysts and experts to work out a policy, and for the skeptics within the Democratic conference Jayapal said she gets the wariness over how to pay for single-payer but said the same question could be put to the current system. "Our healthcare system right now is extremely expensive and bankrupting normal Americans in a way that is completely unsustainable," she said. Medicare for All made its mark this election season in the Democratic primaries, most notably in the surprise upset of Rep. Joe Crowley (D-N.Y.) by the progressive 28-year-old Alexandria Ocasio-Cortez who ran on a single-payer platform. While many Senate Democrats facing re-election are running on criticism of the Trump administration's and GOP-led Congress' massive changes to Obamacare, there is little the party can do with the law substantively until Democrats take the White House. Creation of the new caucus could give single-payer advocates an edge in the next congressional session as Democrats debate where they want to go with healthcare. Correction: An earlier verson of this story misstated the American Nurses Association's role in the caucus launch This error has been corrected.